This year marks the 40th anniversary of Sesame Street. While the 40th anniversary show does not air until November 10th, Google is celebrating today by having Big Bird’s feet as its latest logo doodle. It took a while, but I noticed that the doodle looked a bit different than there usual themed doodles. Usually the letters are in the google themed order – blue, red, yellow, blue green red – but not this time all the letters are yellow in honour of big bird (whose feet are part of toadays logo). If it was not enough for First Lady Michelle Obama appears in the first episode of Sesame Street’s 40th season? Even United States President Barack Obama will be opening the show with a brief video. According to one news source I read, he will say the something like “Todays Sesame Street is brought to you by the number 40”. Like many of the people reading this blog, I grew up with Sesame Street. I learned some very valuble lessons. We all have our favorite characters, for most it is Big Bird, for me It was the Transylvanian Count von Count. In Honour of Count, I am going to leave you these points about Telsec. I hope I get the Transylvanian accent down good. Ok accents do not translate well in the written word, so you will just have to go back to your childhood and imagine Count Von Count saying this. Ooonnne good address at the number one address on Canada’s most famous street, 1 Yonge Street. Twooo Great Virtuall office packages. Toronto mail service and Telephone answering plus mail service. Threeee, large large board rooms, That are free for office clients to use. Foour … I do not have anything for Four, so I will skip to ten. Ten, With over ten different office packages, finding one that suits your needs should be very easy. This year marks the 40th anniversary of Sesame Street. 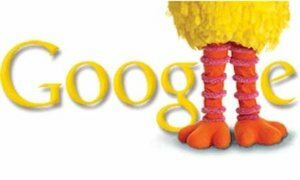 While the 40th anniversary show does not air until November 10th, Google is celebrating today by having Big Bird’s feet as its latest logo doodle. It took a while, but I noticed that the doodle looked a bit different than there usual themed doodles. Usually the letters are in the google themed order – blue, red, yellow, blue green red – but not this time, all the letters are yellow in honour of big bird (whose feet are part of today’s logo). If it was not enough for First Lady Michelle Obama to appear in the first episode of Sesame Street’s 40th season? Even United States President Barack Obama will be opening the show with a brief video. According to one news source I read, he will say the something like “Todays Sesame Street is brought to you by the number 40”. Like many of the people reading this blog, I grew up with Sesame Street. I learned some very valuable lessons. We all have our favorite characters, for most it is Big Bird, for me It was the Transylvanian Count von Count. Twooo Great Virtual office packages. Toronto mail service and Telephone answering plus mail service. Threeee, large large boardrooms, That are free for office clients to use. Ten, With over ten different Toronto office space packages, finding one that suits your needs should be very easy.